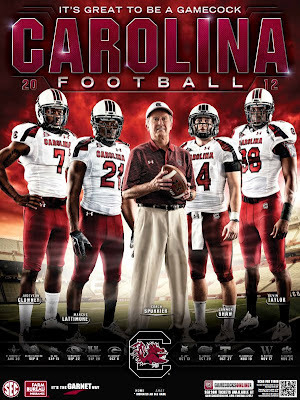 Big expectations at South Carolina, where Steve Spurrier has entered his eighth year as coach. Spurrier lost only 12 Southeastern Conference games in 12 seasons at Florida, and he has already lost 27 at Columbia. But in this what-have-you-done-for-me-lately world, Spurrier is back on top because the Gamecocks have won a combined 20 games in 2010-11. Poster designed by Old Hat Creative. Thanks to Eric.